If you wish to subscribe to our mailinglist, click here or send an email to mailinglist@airsxm.com. We never share our emailaddresslist with others. We appreciate your trust and respect your privacy. After 70 years of having the same look, Princess Juliana International Airport (PJIA) has entered the 21st century with a brand new look and name: SXM Airport. The re-branding is a comprehensive make-over, with a logo inspired by the IATA destination code for the airport – SXM – which is eye-catching and easy to identify and remember,” said SXM Airport Managing Director, Regina LaBega. The SXM Airport re-branding is a positive development for AirStMaarten because it will help make our AirSXM brand more easily recognizable. This will be important for the launching and promotion of our "AirCruises with AirSXM" programme, a new concept in private air travel: multi-destination charters by private plane between St. Maarten, St. Barths and Anguilla first launched in last month's issue. You can read more about the re-branding of the SXM Airport and our "AirCruises with AirSXM" concept below. Not only can you share a charter to St. Barths from St. Maarten, but also from Anguilla as well. For more information about our Shared Charters and to see the constantly updated Shared Charters schedule online, visit http://www.SharedCharters.com. ST. MAARTEN -- AirSXM, St. Maarten's first virtual airline offering private charters, shared charters, commercial flights and budget flights with VIP services to and from St. Maarten, St. Barths, Antigua, San Juan and Anguilla, is now offering AirCruises: multi-destination charters by private plane between St. Maarten, St. Barths and Anguilla. As you know, AirStMaarten specializes in organizing private charters, shared charters, budget flights and commercial flights for our discerning clients. Our service is fast, courteous and professional and we offer clients a wide selection of flights, charters and VIP services to fit their travel needs and itinerary. What makes us unique is our shared charters with seamless connections to St. Barths. What we have now done is taken our itineraries between St. Maarten and St. Barths, from St. Barths to Anguilla and from Anguilla to St. Maarten to combine into a multi-destination itinerary that offers our discerning clients the option to put together a vacation package that entails spending a couple of days in St. Barths and then in Anguilla before returning home via St. Maarten. Clients can choose to share a multi-destination charter or fly exclusively with only their family or friends. All our multi-destinational charters will be executed by private charter whereby clients pay for the whole aircraft or only the seats they occupy. The choice of aircrafts range from 9-seater BN Islanders to Cessna Caravans to 16-seater Twin Otters. Clients wishing to make their multi-destination vacation on St. Barths and Anguilla an all-inclusive package deal should contact us at AirSXM.com and let us know which resorts, hotels or villas they want to stay at in St. Barths and Anguilla and we will contact these accommodation providers to work out a personalized package offer that includes luxury accommodations, breakfast and/or dinner, sightseeing tours and other activities. So if you are interested in flying from St. Maarten to St. Barths and staying in St. Barths for a couple of days at any of the finest accommodations there and then flying on to Anguilla for another couple of days stay at any of Anguilla's top accommodations, before returning home via St. Maarten, then send us an email via sales@airsxm.com with "Multi-Destination Charters" as the subjectheader. Or click here: mailto:sales@airsxm.com?subject=Multi-Destination%20Charters&body=Yes%2C%20I%20am%20interested%20in%20your%20multi-destination%20package%20offer. And we will contact you to discuss the options. AIRPORT--Princess Juliana International Airport (PJIA), a major Caribbean travel and transit hub, has been rebranded to be SXM Airport. Over 200 invited guests gathered at Gate A1 of the Princess Juliana International Airport (PJIA) on the Saturday evening of February 4th, 2013, for a first class presentation of the rebranding of the St. Maarten Airport, which also serves as a leading Caribbean travel and transit hub, into SXM. At SXM, “our whole aim is to re-position the Princess Juliana International Airport as a leading hub in the Caribbean and to promote our ultra-modern facilities and the quality of our services,” said LaBega. “The re-branding is a comprehensive make-over, with a logo inspired by the IATA destination code for the airport – SXM – which is eye-catching and easy to identify and remember,” said LaBega. Chairman of the SXM Airporr Board of Directors, Clarence Derby joined LaBega in pointing out that, “The timing for this event could not be more perfect: with the airport acquiring its Baa2 investment grade ratings from Moody’s,” repurchasing its old bonds, offering of new bonds – oversubscribed from the inception by foreign and St. Maarten investors; raising over $130 Million at a 5.5% interest rate; and recently voted as the airport with the most stunning landing in the world by PrivateFly.com. The new brand image launch also coincides with the just re-branded website; the start of runway resurfacing, and airport expansion project, which includes the new FBO building to better service private plane passengers; constructing a new 15,000 barrel fuel farm at the airport to eliminate running out of fuel, and “revamping the concession space, integrating art with retail, and food and beverage, to maximize non-aeronautical revenues and “provide a first class environment to radically improve passenger experience,” all “coupled with the lady celebrating her seventieth birthday,” said Derby. Minister of Transport, Economic Affairs and Telecommunications Romeo Pantophlet said that the “government of St. Maarten is proud of the improvement of the airport in the past years.” He praised past and present airport workers and directors. Rafael Cardozo, president of the marketing agency Tambourine, explained the research and design process that produced the new brand. A much-enjoyed feature of the launch was on a fashion show of past and present airport uniforms by SXM staff and managers – Robin, Stefania, Peggy, Mirto, Hilda, Ambrose, and Erica. The spiffy new grey and navy and teal uniforms that will soon be introduced to the company were also modeled. Manager of Marketing & Communications, Kalifa Hickinson, expressed her delight at officially launching the new look of SXM airport. “We have worked very hard and have been looking forward to this day – we are very, very proud,” she noted. The Soualiga Brass band performed early the program while the Kool Berry Jam band performed after the launch presentation. Radio personality Jacques “Billy D” Hamlet served as the Master of Ceremony. A celebrity-style “after party,” with the live performance by Onyan and the 3 Cylinder band, took place at Tantra nightclub for all of the guests of the SXM rebranding launch. 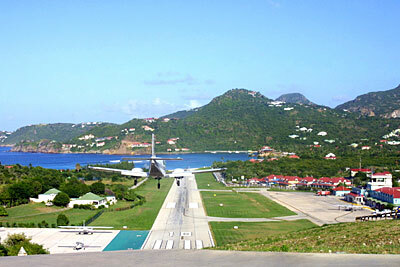 If you are thinking about flying from St. Barths to Anguilla for a daytrip to play golf, to go sailing or just to go sightseeing for the day or to spend a couple of days in Anguilla at a resort or villa before returning home, submit a reservation request online at www.airsxm.com. When you book with AirStMaarten via www.AirSXM.com, you now have the option of paying via Paypal using the "Bill Me Later" option. If you qualify, you can choose to pay in full within six (6) months interest-free, with no money down, easily! Submit a reservation request online at www.airsxm.com and ask to be invoiced via Paypal.com. We will then send you an invoice via Paypal and you can choose to pay using Bill Me Later. 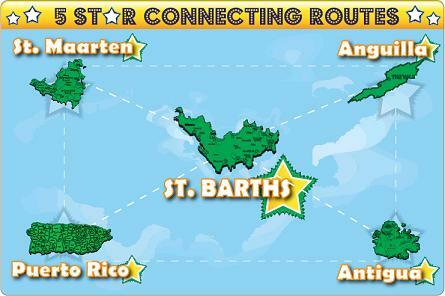 If you qualify, you will get to pay for your travel to St. Barths with payment terms. If you pay in full within six months, it will be interest-free. Click on the banner above for more information about this new service.